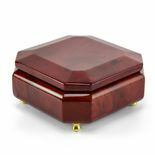 A music jewelry box offers a unique and treasured means for storing jewelry. Every time the box is opened to retrieve jewelry, a beautiful tune will be played. 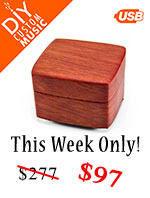 You don't have to settle for a jewelry box design that you don't like in order to play your desired tune. 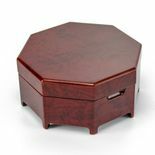 When you purchase a music jewelry box here at Music Box Attic, you can choose any tune for the style of jewelry box that you prefer. 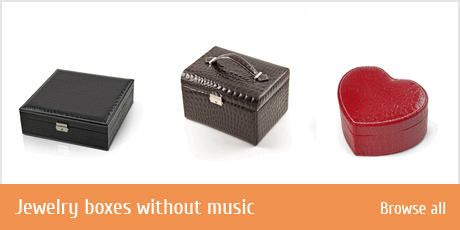 A variety of music jewelry box styles are available on our website. Most are made from high-quality wood products, but some feature other materials such as stained glass or fabric coverings. Wood options include mahogany, elm, burl-walnut, and pine. All have a glossy finish and feature elegant velvet linings and compartments inside each box. 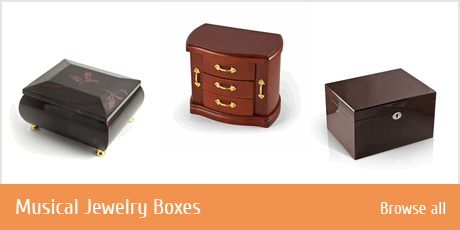 Some of our music jewelry box designs are classic in style with a simple wood finish. Others are adorned with fabrics, inlays, tassels, or other interesting additions. 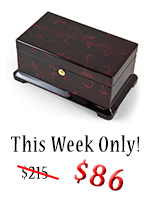 For an elegant look, you might choose a solid wood music box covered in Victorian fabric. 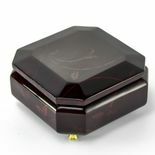 You may also choose a music jewelry box with artwork added to the design. For instance, we carry a jewelry box that features the work of world-famous artist Glynda Turley. 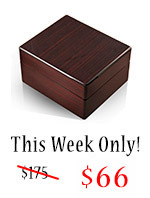 For a sentimental feel, you can choose a picture jewelry box. The lid has a clear area where you can insert your own photographs. So, not only will you hear a pleasant tune, but you will also observe a memorable photograph each time the lid is opened. No matter what your design preferences are, we have numerous options for you here at Music Box Attic.